On Saturday 13 May we had our annual minibus excursion to visit the Pubs of the Year (PoTY) of the other four Sussex Branches as our contribution to deciding the overall PoTY for Sussex, for which a standard and detailed CAMRA scoring system is provided, capturing the whole pub experience, not just the beer. The minibus started at 9.30am from our PoTY, The Tower in St. Leonards, but not before an initial drink there, having persuaded the pub to open very early in honour of this special occasion. Others joined the minibus at Bexhill, Eastbourne and Lewes but had to remain thirsty until nearly 12.00 before we arrived at our first destination, The Inglenook Hotel in Pagham. Various beers were sampled, from the five on offer, all in very good condition. We also enjoyed a very pleasant lunch there, sitting outside in the sunshine. Quite unusual to find a hotel offering such a good range of real ale. Next up was The Anchor Tap in Horsham, a Dark Star pub. The owner, Horsham Council, wanted very much for the building to be preserved as a pub, rather than being converted to another use as often happens. Consequently after many years as a shoe shop and coffee shop it was reverted back to its original use as a pub in Spring 2016 and now offers 6 hand pumps plus 10 keg taps. Our stay there was shorter but again several of their beers were tried, from the extensive offerings, detailed on the prominent board on the bar wall. However, we stuck to the cask offerings, again finding them all in fine condition. Traveling back South, we next visited Anchored in Worthing, a micro pub just off the sea front. By now it was middle to late afternoon and we made our selections from the three or four ever changing local Sussex beers. Not surprisingly, for a Saturday afternoon, it was standing room only but we weren’t bothered as conversation flowed freely between everyone there. There is no bar as such but the owner, Nigel, provided a very efficient waiter service from the casks in the back room. Again the beers were in very good form. 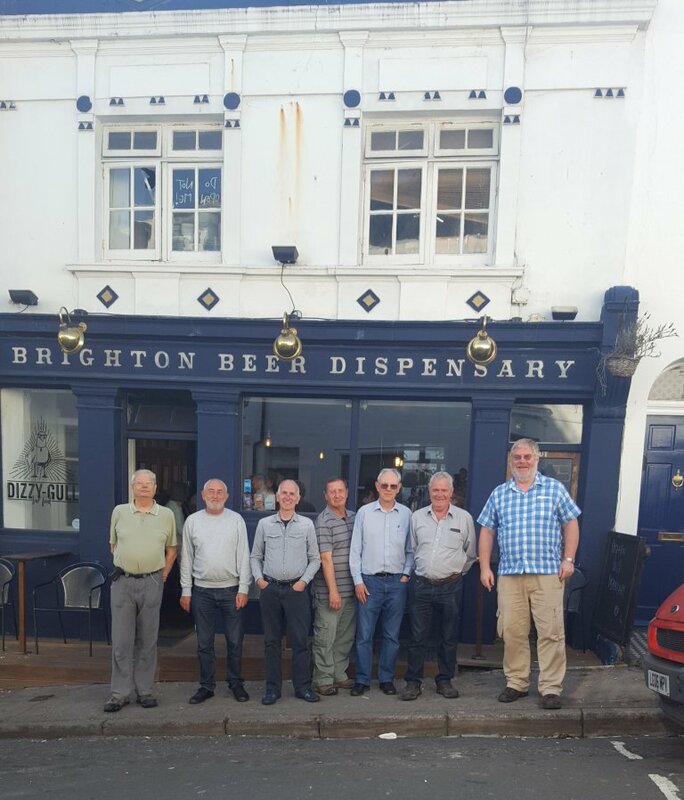 Our final pub was the Brighton Beer Dispensary. There are 9 hand pumps, 6 for beer and the others for cider. In addition there are 9 keg taps. Another very good beer choice but this time national as well as local and for the location, very reasonably priced. All beers tried were pronounced in very good condition and it was with some regret that we finally left the last pub on our trip. Thanks to our guest Barry for taking the photo as we waited for the minibus. Particular thanks goes to Bill for organising the day and the transport and also to our driver Brian. He not only managed to negotiate narrow side streets and drop us off outside most of the pubs (only exception being Horsham where we had to walk all of 100 yards through a pedestrian precinct) but also drove nearly 200 miles in the process. We now await the results from the other four Sussex Branches before learning the overall Sussex PoTY.